FIFA World Cup 2018 Schedule, Fixtures, Time Table PDF can be downloaded from this website. The matches will be played from 14 June to 15 July 2018. 32 National teams will be entertained in this tournament to play 64 matches in 32 days. All the 32 games will be played at 12 Venues. Russia’s Capital Moscow will host the final of 2018 world cup on 15 July. The 32 nation participating 2018 fifa world cup in Russia held on 14 June to 15 July 2018. The kick off match between host Russia vs (group A2) at Luzhniki stadium. Fifa has been announced Fifa world cup 2018 fixture pdf download. The kick off match start time 18:00 Moscow. The two semi finals and final match also render at Luzhniki Stadium. Russia prepared total 12 venues for world cup 2018. Host Russia automatic qualify for football world cup 2018. Brazil is first team who secure them for 2018 Russia world cup. see here the list of 2018 fifa world cup qualified teams. We are upload below fifa world cup 2018 fixtures pdf download file. click on link to download the pdf fixtures. 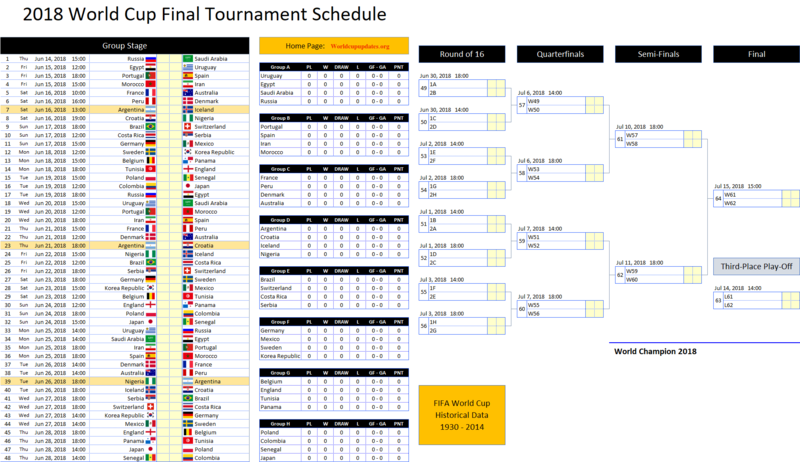 After Download FIFA world cup schedule pdf double click the file. It will autometically open in your default browser. FIFA World cup 2018 Time Table is divided into two stages [Group Stage] & [Knockout Stage] which further divided into 3 Stages named [Round of 16, Quarter-finals, Semi-finals]. After this there is one 3rd/4th place match and one final will be played. Group Stage: There are 8 groups from Group A to Group H. Every group includes 4 teams. Russia being the host of world cup placed in Group A and will play first match of the tournament. – Only Top 2 teams from each Group will qualify for Round of 16 in Knockout Stage. Knockout Stage: In this stage every team will play one match and if the match is tied at the end of 90 minutes then 2 periods of extra time 15 minutes will be played. If after extra time still the match is tied then Penalty shootout will be taken. In the below table we give all country time table. 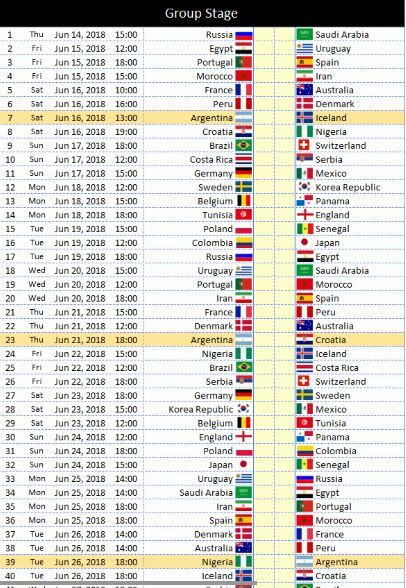 Fifa published world cup 2018 schedule pdf in GMT/UTC and Russia time. So, you can know when will world cup match start in your country local time. Example you are live in Bangladesh and 2018 world cup 1st match Russia vs Saudi Arabia will start on 15:00 GMT. In this table we see Bangladesh time is ahead +06:00 time vs GMT. So, add +06:00 time more on Russia vs Saudi Arabia GMT match time if you watching 2018 world cup from Bangladesh. Bangladeshi people can watch the match at 21:00 in their local time. Russia and Brazil confirms their participate to 2018 fifa football world cup as earliar. Russia is host country of the 2018 world cup in Russia. So, Russia participating is certain before the qualifiers. As a host team advanced they need not to play they qualification round. Fifa world cup 2018 Brazil is 1st team to crossed the qualifiers. Brazil qualify them from Conmebol. Conmebol has highest place in fifa world cup. Argentina, Uruguay, Chile and some heavyweights team is in Conmebol. In this confederation of south American 4 teams will take participate in fifa world cup 2018. Fifa divided 32 teams into 8 groups. Every group have 4 teams. The groups champions and runner-up will take part round of 16. In this 16 teams 8 teams will go to the quarter-final then 4 teams go to semi-finals and at least two teams will play 2018 fifa world cup final.